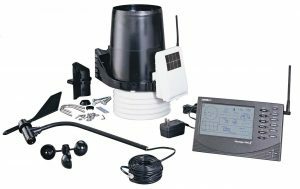 There are many popular weather stations having integrated unit in the market on of these stations is Davis instruments vantage pro2 wireless that is very reliable due to its versatile sensor configuration. In addition, installing it is very easy and it is known for giving accurate data. This weather station consists of 5 sensors namely thermometer, hygrometer, rain gauge and an anemometer. It also includes a console that can either be cabled or wireless. Davis instruments vantage pro2 wireless has a wireless integrated sensor unit that is solar powered. The unit comprises of a thermometer, hygrometer, rain gauge, and anemometer that is fitted with a 12-meter long cable. The solar panel is also included to provide power to this sensory unit. The thermometer and hygrometer are enclosed in a standard radiation shield to enhance accuracy. The shield protects the sensor from extreme heat and radiation. The sensory unit transmits data wirelessly to theradius of up to 1000ft. the line of sight of this unit ranges from 200 to 400ft due to obstruction and walls. To increase the radius of transmission, one can repeaters. This can extend the radius to a maximum distance of 2.7 km. The console is made of an LCD display that has akeyboard that is easy to use. The dimensions of the display are 6 inches by 3.5 inches. It has a wireless feature though it can also be cabled depending on the purpose for which it will be used. The information displayed on this console include date, time, sunrise and sunset times and moon phases. It also displays various weather aspects namely temperature, humidity, wind speed and direction, atmospheric pressure and precipitation. In addition, other variables such as UV radiation, leaf wetness, and soil moisture can also be viewed. From the data collected from the individual sensor on the sensor unit, the forecast can then be calculated. The forecast is presented using clear weather icons that show aspects like sunny, cloudy, rain or snow among others. The display allows graphical analysis of data and the forecast is refreshed at an interval of 1 hour. The report will be displayed at aninterval of 2.5 seconds. In order to get alerts on time, the console has alarm tone option. The alerts give information on possible weather calamities and disasters. This will help you avoid catastrophes that come with these disasters. The consoles can be powered by an AC adapter or 3 C batteries. Vantage Pro 2 Wireless is one of its kind weather station that incorporates wireless transmission of data. It has the unique capability of sensing soil moisture and leaf wetness. This feature is very useful to farmers as they can get information about the soil condition. It will be easier for them when it the right time to plant or even spray their crops. The humidity and temperature sensors can be used to determine temperature and humidity of up to 8 different locations. This makes comparison and analysis of weather conditions possible. This weather station can be installed so easily. The sensor unit is compact and hence it requires no professional assistance during installation. Though this weather station has its advantages, it also has its shortcomings. Since this device is solar powered, it is not recommended for areas that have cloudy or rainy weather. With prolonged cloudy or rainy weather, the stored energy in the batteries will get used up halting the operation of the device. During extreme weather conditions, the signals can get lost due to the wireless operational design. When checking soil moisture for a large area, accuracy might be affected since soil moisture varies from one location to another. To theaverage budget individual, this device may not be affordable since it is a high-end weather station. If you are looking for a high quality and reliable weather station in the market, then Vantage Pro2 wireless will be your choice. This is because it has appealing features that are coupled with durability and accuracy. This weather station is a little more expensive due to its high quality compared to others but it a useful device to farmers as well as other persons interested with weather data and forecast.